Bluehost Hosting Plans: Which is Best Shared Hosting from Bluehost? Home » Bluehost » Bluehost Hosting Plans: Which Is the Best Shared Hosting Plan from Bluehost? Bluehost Hosting Plans: Which Is the Best Shared Hosting Plan from Bluehost? Bluehost offers a wide range of hosting plans. But shared hosting is the cheapest. Here are the various shared hosting plans offered by Bluehost along with the discount. Are you looking for the best Bluehost hosting plans? Did you know what’s the most important thing while building a website? If you said, web hosting, you’re absolutely right. Most people don’t realise the importance of having a reliable and secure web hosting choice and they often go for bad hosting choices only to regret later. If you’re looking for a reliable and affordable web hosting choice, we highly recommend you to give a try to Bluehost. Although Bluehost offers a wide range of hosting options like VPS hosting, dedicated hosting etc, we’ll be only talk about shared hosting plans in this post which is widely used worldwide. Let’s get started and find out the Bluehost hosting plans along with their features, pricing, pros and cons. 1 What are the various shared hosting plans offered by Bluehost? 1.2 How reliable is Bluehost as a hosting service? 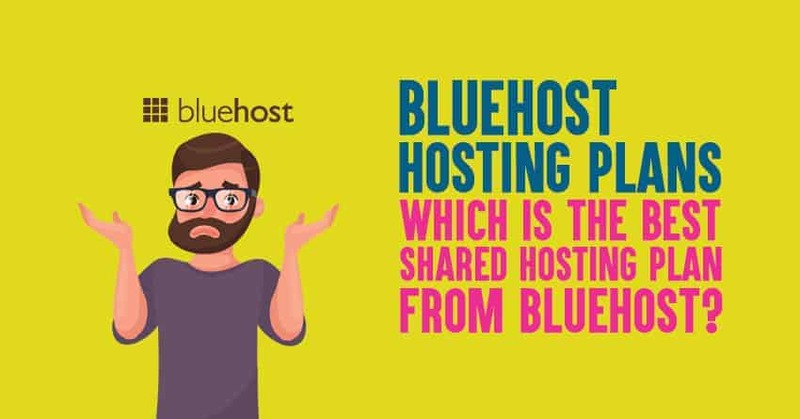 What are the various shared hosting plans offered by Bluehost? Bluehost is currently offering the following pricing plans in shared hosting. 1. Basic: This is the cheapest shared hosting plan from Bluehost which costs you $3.95 per month and if you’re a beginner, you can simply opt for this shared hosting plan where you’ll get the following things. 2. Plus: This is the medium shared hosting plan where you can actually install any number of sites which costs you $5.95 per month where you’ll get all the following feature. 3. Choice Plus: This is the widely used shared hosting plan from Bluehost which costs you $5.95 per month (same Plus plan which is discussed above for a limited time) and you’ll get access to the following things. 4. Go Pro: Did you know that the Go Pro shared hosting package from Bluehost has 80% less hosting accounts per server? That means, it allows the use of more resources per account which includes more CPU usage, disk usage, bandwidth and so on. So if you’re looking for more speed, more power with less users in shared hosting from Bluehost, you should definitely go for Go Pro package which costs you $13.95 per month and you’ll get all the following features. Let’s now talk about some of the incredible features offered in shared hosting environment of Bluehost hosting plans. Millions of people use Bluehost hosting for one major reason: it offers excellent features along with a wide range of freebies. That being said, here are few freebies that you get with all the shared hosting plans from Bluehost. Let’s explore about each one of the freebies mentioned above so you’ll get an idea about how much money you can actually save if you sign up for Bluehost shared hosting plans. Domain name costs you anywhere around $10 to $20 depending on which platform you use to sign up for. But when you’re signing up for Bluehost shared hosting, you can register domain free for 1 year. SSL certificate typically costs you around $10 per year which you’ll be saving when signing up for Bluehost hosting plans. Above all, Bluehost gives you exclusive access to marketing offers worth $200 which you can use to display your website ads on Google AdWords, Yahoo or Bing to get more search traffic to your sites. How reliable is Bluehost as a hosting service? Most people are not aware of the fact that Bluehost is recommended by WordPress officially. Bluehost is founded in 2003 by Matt Heaton and Danny Ashworth in Provo, Utah and Bluehost currently has a staff of over 750 people working around the world. Bluehost is used by over 2 millions website worldwide which is considered as one of the most affordable hosting choices. Since 2010, Bluehost is a part of EIG (Endurance International Group) which is the industry leading company. Shared hosting is the CHEAPEST Bluehost hosting plans where the pricing plans start at just $3.95 per month and offers you a 30 day money back guarantee. As you can see above, you can manage everything from billing information to marketing tools and emails to databases from Bluehost control panel. You can also use Bluehost live chat to connect with their customer staff at anytime you want from anywhere around the world as they provide 24/7 live chat support. There’s no point of finishing up this review on Bluehost hosting plans with talking about the pros and cons of Bluehost. Here are some of the most important questions you might have in your mind about Bluehost hosting plans. On a shared server, you’ll be sharing resources with dozens if not hundreds of other customers worldwide. The biggest advantage of using shared hosting is that Bluehost can provide a powerful and reliable server at a fraction of the cost to each client since the hosting fees will be divided and shared among several people who are using the same server. The only downside to shared hosting is that it leaves slower loading times in case if there’s a traffic spike among the websites hosted on the server. 2. Does Bluehost offer SSL certificates? If yes, how to activate SSL certificates on Bluehost? Once you’re set up an account with Bluehost, it will automatically assign SSL certificates and install itself to your new and existing domains. So you don’t have to worry much about the technical part of assigning and installing SSL certificates. Just in case if they are not automatically assigned you can manually enable the SSL certificate from your Bluehost control panel. Here’s how you can activate SSL certificates on Bluehost. Click the Addons tab from your Bluehost control panel and locate SSL Certificates, and click on the learn more button. Click the get started button under WordPress Free SSL. Then, click the Install button. That’s it, you’re done! Within a few hours, it will be activated. 3. How good is Bluehost shared hosting? We personally have been using Bluehost on several of the websites and we found it one of the best hosting sites that comes with a lot of features such as easy to use control panel, excellent customer support, free SSL and so on. It’s also one of the oldest hosting service company which has been operating since 2003 and used by over 2 million websites worldwide as their preferred hosting platform. So if you’re looking for great, reliable and affordable hosting plans, Bluehost is definitely right for you. 4. Can I cancel my Bluehost shared hosting account any time I want? Yes, you can. But you should know that set up fees is non-refundable (if any). If you cancel your shared hosting account from Bluehost in the first 30 days of service, you’ll qualify for a full refund at the monthly rate. When canceling your Bluehost account prior to your accounts end of term or downgrading your account to a term for less than a year; you forfeit the domain registration coupon and Bluehost deducts $15.99 from your final refund amount to cover their costs (since it offers 1 year free domain registration). 5. Does Bluehost offer monthly hosting plans? Unfortunately Bluehost does NOT offer monthly hosting plans. At the least, you need to buy 12 months hosting plans from Bluehost in order to start using their hosting environment. That being said, you can get a free domain name for 1 year even if you’re going with the cheapest hosting plans from Bluehost. Yes, there are other hosting alternatives like HostGator that offer monthly hosting plans unlike Bluehost but the good thing about using Bluehost is that it actually gets cheaper as you pick 3 years (36 months) plan over 12 months plan and pick any of the plans from Bluehost. As we wrap up the Bluehost hosting plans, let’s first look at the definite pluses. Bluehost is WordPress friendly and offers affordable hosting plans. You don’t have to rob a bank to start using reliable hosting service like Bluehost as their shared hosting plans are much cheaper when compared to sites like WPX hosting, WP Engine and so on. All in all, if you’re looking for a reliable, feature rich and secure web hosting platform, Bluehost is definitely for you. So what are you going to pick from the above mentioned Bluehost hosting plans?